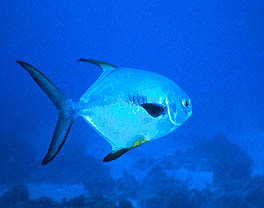 This deep-water fish is called a Permit. Click here to learn why Permits are seldom seen near coral reefs. 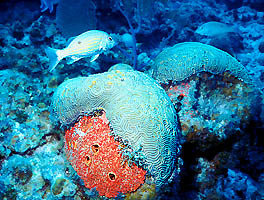 This picture features a battle between a Brain Coral and an Orange Boring Sponge. You'll also see a pair of spot-backed Lane Snappers. 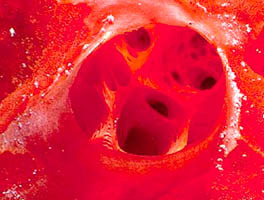 Click here to look into the excurrent pores of a healthy Red-Orange Encrusting Sponge.